Bakery Cottage was built in the early 1920's by the Feist family who were the local bakers. She (definitely a she) is very enchanting with polished wood floors and native timber wall sarking. 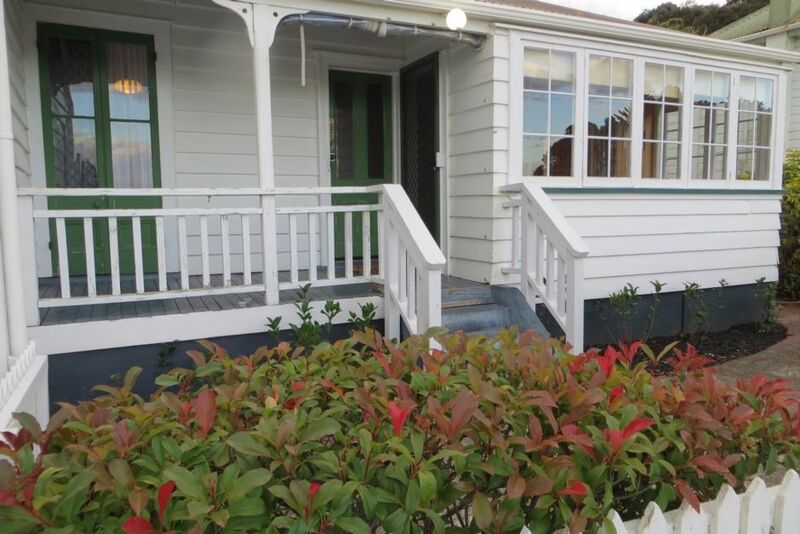 Ideal for 2 couples to soak up her undeniable charm, chill out and enjoy all that beautiful Doubtless Bay has to offer. Start the day with a cup of tea on the verandah and enjoy the harbour view. Take a short walk to one of the cafes for breakfast and browse the shops, including the Flax Bush located next door. Spend the day at one of the numerous Doubtless Bay beaches within easy drive. End the day with a cocktail on the verandah followed by a bbq in the private courtyard at the rear of the cottage or walk to the Fish and Chip shop for dinner. Rates are for 2 people, extra people are charged at $20 per person per night. Rates may vary during public holidays, please enquire. Limited car parking at cottage - 1 vehicle only. Off site secure parking available for boats. Short, easy walk to cafes and shops. Ideally located within easy walk of town including shops and supermarket.